Alaskan Bush Adventures: Lessons From the Land. Lessons From the Lord. There is a vast expanse of wilderness that lies within the borders of the United States-a land where there are no roads, no malls and no power lines stretching across the horizon. Instead, nature is on display in all of its glory. With forests, meadows, river basins, lakes, and mountains-the variety is as diverse as the expanse of the land itself. This is Alaska, the Great Land. Within these wild stretches of Alaska lie small, scattered, remote villages which are home to various ethnic groups of Alaskan natives. In the spring of 1990, Don Ernst and his wife moved to one of these isolated villages to begin a church planting ministry. During the next 27 years, life and ministry were within the realm of this setting. There were lessons learned from the elders and from the land. During this time of ministry there were also lessons learned from the Lord. The author shares these times of life lessons and spiritual growth in the tradition of the culture: stories. These stories of life and ministry share the tragedies and the triumphs sprinkled with grief and laughter. The author uses stories to instruct, encourage, and challenge you as he unfolds them in the real life setting of the Alaskan bush. There is a vast expanse of wilderness that lies within the borders of the United States-a land where there are no roads, no malls and no power lines stretching across the horizon. Instead, nature is on display in all of its glory. With forests, meadows, river basins, lakes, and mountains-the variety is as diverse as the expanse of the land itself. This is Alaska, the Great Land. Within these wild stretches of Alaska lie small, scattered, remote villages which are home to various ethnic groups of Alaskan natives. In the spring of 1990, Don Ernst and his wife moved to one of these isolated villages to begin a church planting ministry. During the next 27 years, life and ministry were within the realm of this setting. There were lessons learned from the elders and from the land. During this time of ministry there were also lessons learned from the Lord. The author shares these times of life lessons and spiritual growth in the tradition of the culture: stories. These stories of life and ministry share the tragedies and the triumphs sprinkled with grief and laughter. The author uses stories to instruct, encourage, and challenge you as he unfolds them in the real life setting of the Alaskan bush. 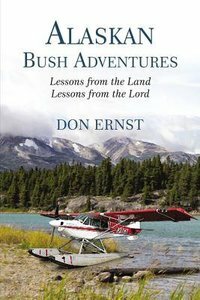 About "Alaskan Bush Adventures: Lessons From the Land. Lessons From the Lord."